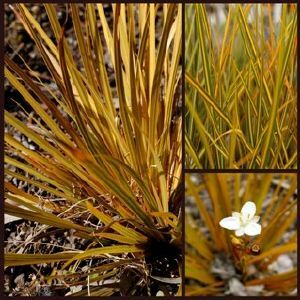 Libertia ixioides has fantastic olive green, unusual evergreen grass-like foliage with bright central yellow stripes. Pure white starry flowers in late spring, followed by yellow berries in autumn. Its compact and neat habit makes this a bright feature in pots or in the front of the border. The plant takes on an altogether more dramatic appearance during the autumn and winter when the foliage turns golden yellow. Libertia is a genus of monocotyledenous plants in the family Iridaceae containing 15 species in the southern hemisphere. A number of species are endemic to New Zealand. They are all perennials growing from short woody rhizomes, with simple, linear or narrowly lanceolate basal leaves, which are often green but may be red or yellow depending on the species. The showy white trimerous flowers are open in spring and are followed by capsules opening by three valves which contain the numerous black seeds. The genus was named after Anne-Marie Libert (1782–1865), a Belgian botanist. Grow in moderately fertile, humus-rich soil that is moist but well-drained. Needs a warm sunny position and a dry mulch for protection in winter in more exposed locations.